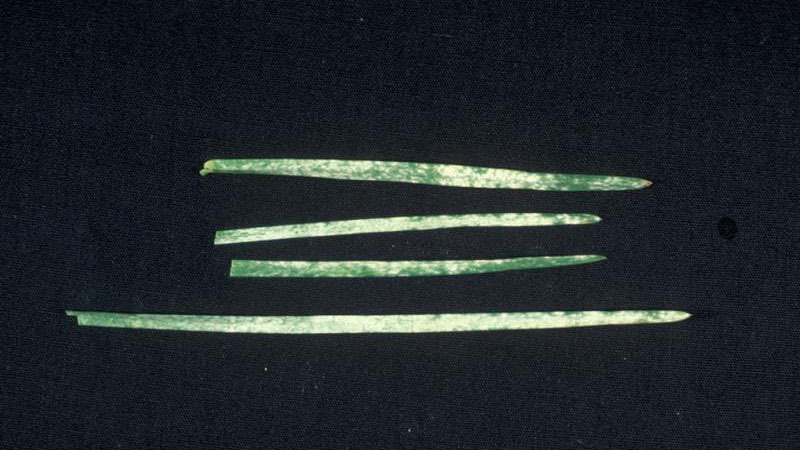 The symptoms of powdery mildew are typically most severe in heavily shaded areas. 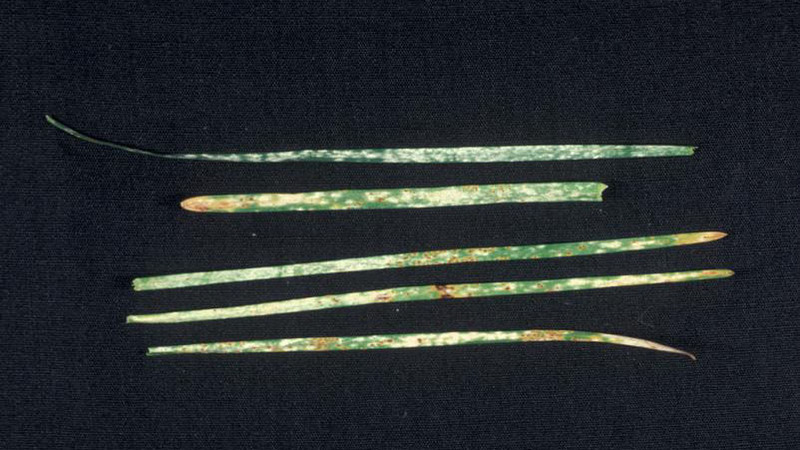 In the initial stages of disease development, a white or gray, powdery growth is evident on infected leaves. Heavily infected leaves turn yellow or red and die slowly. If left uncontrolled for several weeks, powdery mildew will cause significant thinning of the turf and may also increase its susceptibility to environmental stresses or other pests. The fungus survives the winter in living plant tissue. Spores are produced in the spring and are spread to healthy tissue by wind. The spores germinate and infect leaves during cool, humid conditions in the spring and fall. Because sunlight inhibits growth of the powdery mildew fungus, turf that is growing in dense shade is most prone to the disease. Unlike most foliar diseases, leaf wetness is not required for development of powdery mildew, but high humidity is necessary. Planting shade-tolerant grasses, such as the fine fescues (hard fescue, chewings fescue, or red fescue), is one of the best means of preventing severe problems with powdery mildew. A mixture of Kentucky bluegrass in combination with tall fescue and a fine fescue is preferred. Turf growing in shade uses less nitrogen, requires less water, and is less tolerant of low mowing. Management practices should be adjusted accordingly for shaded areas. Apply no more than 1 pound of nitrogen per 1,000 square feet at any one time. Maintain mowing height at approximately 3 inches to increase rooting and provide greater leaf surface for photosynthesis. Water deeply and infrequently to enhance rooting and reduce leaf wetness. Avoid light, frequent watering and do not irrigate just before sunset or after sunrise because this extends the leaf wetness period which favors disease development. Pruning, removal, or careful placement of trees and shrubs to increase light intensity and air movement will help control powdery mildew. Through the use of proper cultural practices, powdery mildew can be managed to acceptable levels without fungicides in most cases. 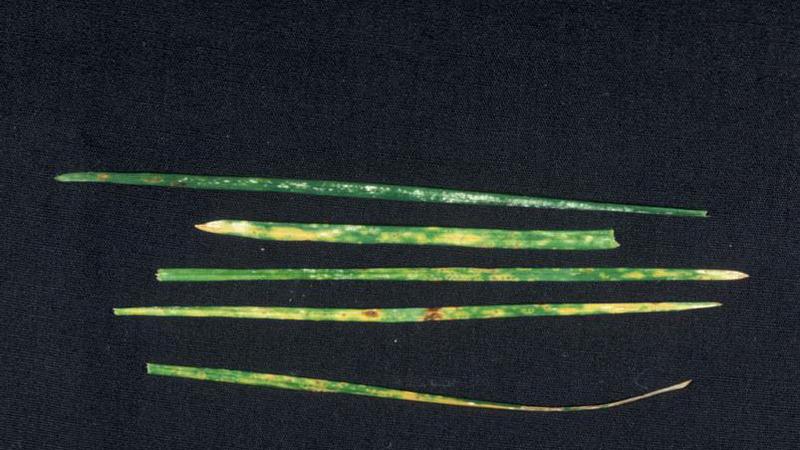 Fungicides can be applied on a curative basis if an unacceptable amount of disease develops. Mapping affected areas for treatment will help to minimize fungicide use. Figure 1. Powdery mildew foliar symptoms. Figure 2. Powdery mildew foliar symptoms. Figure 3. Powdery mildew foliar symptoms.